I just want to also take the opportunity to thank everyone for your feedback, photos and lovely messages about my recipes, you have well and truly made my blog stats go into meltdown and I have seen in the last 2 months more activity than I had in my entirety of my 2 years of blogging, so thank you, thank you, thank yooooou & please continue to let me know if you love the recipes and if you're trying them. The great thing about this recipe is that you can adapt it to what you like and how much flavour you want so please be aware that my tastes may be different to yours, you can add as much or as little veg as you want and almost every veg works for this dish. With the spices, each is crucial but you can add as little or as much as suits you. 1. On a medium to high heat spray your frying pan with fry light & add your chicken breast strips, fry for 10 minutes or until white on the outside. 2. Whilst your chicken breast is cooking, boil your dried egg noodles in a saucepan of boiling water for 5 minutes on a medium heat, until separated, drain water and add to wok. 3. Just before the chicken is cooked through, add the onions, mushrooms and beansprouts to the chicken and stir often until the veg has gone soft. 4. When the chicken is cooked and the veg has softened, add to the noodles in the wok away from the hob and fold together until there is an even consistency. 5. Still away from the hob add your chinese 5 spices, garlic granules and dark soy sauce to the wok, fold the spices & sauce into the noodles, chicken and veg until evenly spread. 6. 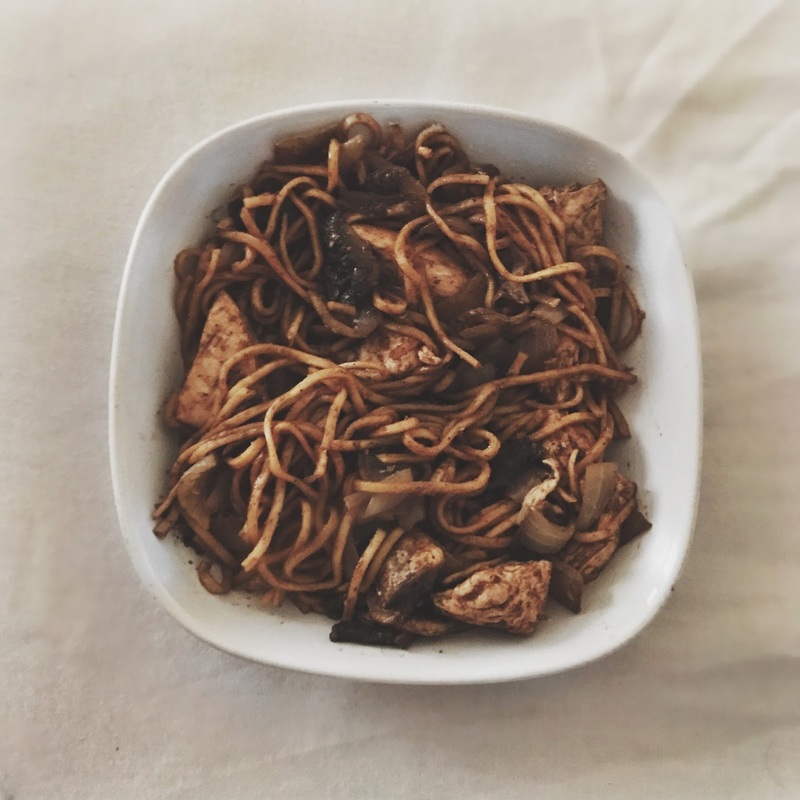 Put the wok onto a low heat and spray fry light into your chow mein, then stir and fold constantly to ensure that it doesn't stick to the bottom of the wok. 7. Stir and fold for 5 minutes, you should start to see it steaming, turn off heat, serve and enjoy. I usually serve mine with a side of broccoli but you can serve up as a fakeaway with syn free chips or anything else you fancy. I would not recommend to freeze this meal, but you can refrigerate and consume within 48 hours. If you are on the Slimming World plan all dried noodles are FREE however if you are using fresh egg noodles you will need to syn these. I have made this and frozen it, it reheats from frozen perfectly in the microwave . Thanks for an awesome recipe !